S'IL VOUS PLAÎT noter que nos tarifs sont listés dans $ US. CECI EST hors de notre contrôle et nous nous excusons pour ce désagrément. UTILISER la conversion de devises dans nos tarifs SECTION DE DOLLARS CANADIENS RÉELLES. quartier familial, Throw Cottage Pierre accueille les familles, mais ne sont pas en mesure d'accueillir des groupes d'adultes ou des étudiants en vacances. Cette maison a été construite pour les familles et possède les touches qui vous feront sentir comme chez vous. Il dispose d'un plancher de cheminée en pierre au plafond, des couettes douillettes, les planchers de tuiles chauffées et les boiseries de qualité tout au long. Adapté aux enfants des jeux, des jouets, des livres et des films ne sont que quelques-uns des éléments qui accueilleront vos petits quand vous arrivez. Que vous pelotonner avec un livre devant la cheminée, faire griller des guimauves dans le foyer sur la terrasse, randonnée sur les sentiers locaux, nager dans le lac, prendre le canot ou un kayak pour une rotation, ou faire une partie de golf, vous vivrez le rythme de vie offerte dans ce lieu unique. Nous sommes situés sur Lindell Beach à la fin de Cultus Lake. Les randonnées et pistes cyclables, dans une forêt privée par les résidents locaux, vous aider à explorer nos paysages spectaculaires. Un tribunal de diamant de base-ball et volley-ball est offert pour votre usage, en plus des quais, complet avec un plongeoir et radeaux de natation. (Quais flottants) Une courte promenade à la crique vous récompensera avec des aperçus saisonniers de frai du saumon et trottiner faune. Throw Cottage Stone a fenestration généreuse, qui offrent des vues spectaculaires sur imposants sapins et les montagnes enneigées de saison. La zone commune de l'étage inférieur dispose d'un plan d'étage cuisine / salle à manger et salon à aire ouverte. Notre parole à cheminée de roche au plafond offre un endroit confortable et relaxant pour profiter de la superbe vue sur les montagnes imposantes. à une courte distance, vous trouverez toboggans, golf, mini-golf, plages publiques, commerciaux et d'intérêt local. S'il vous plaît visitez notre site Web pour des photos plus intérieurs et saisonniers de chalet et de la zone. Planchers chauffants, mezzanine ouverte surplombe cheminée en pierre, des jouets pour enfants. Lovely neighborhood. So peaceful. Super walks to lake and in the neighborhood. Love the open plan. Beds so comfy. House is beautiful. Love the fireplace and you gave us the best kindling anyone ever sliced. One thing...Great home was freezing on arrival and it took 5hours to heat it up. Perhaps someone should turn on the heat a few hours before arrival? Really a special stay that we recommend to folks wanting a unique getaway. Our family spent two months at Stone's Throw Cottage over the winter. The home is spacious and the views from every window are majestic. The home has everything a family could need - right down to toys and games for the kids, bikes for the family and canoes. 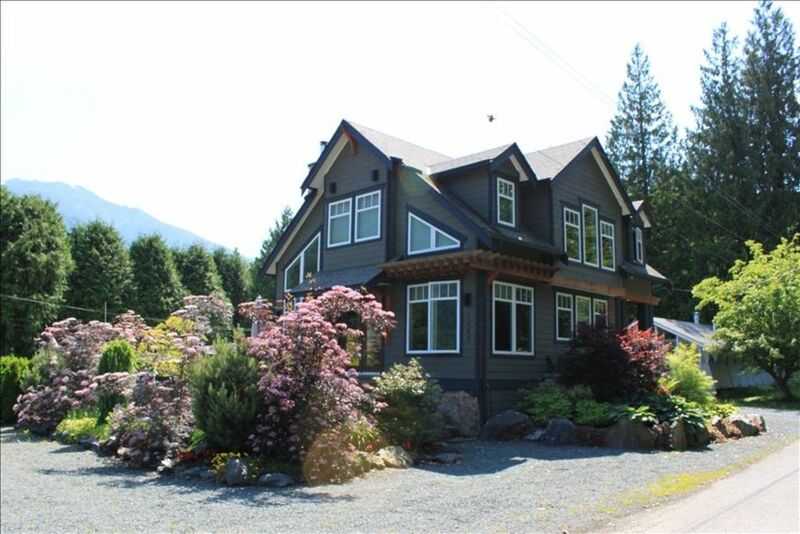 The home is 2 minutes walk from the serene lake and there are squirrels and birds all around. In the winter it is a very quiet and peaceful part of the world to chill out in. Monica was very responsive and made sure we had everything we needed to make our stay comfortable. I would highly recommend Stone's Throw Cottage. We met our kids halfway at Stones Throw and loved the large gathering area and kitchen. ; We all cooked together and loved playing games and doing puzzles when the weather was rainy. Cultus Lake is lovely and we were hoping to gain access to the beach but it appeared that the lake front was all private property. Nevertheless we found some great walking trails around the lake. We are so happy to hear your Thanksgiving celebrations were a success and that you enjoyed your stay at our cottage with your family! Our cottage is part of a strata and the docks etc. all have signs stating private property, but, as our guests you have full access to them. I'm sorry this wasn't clear to you. Please call or email me next time for clarification on anything like this ... we hope you stay again! Stone's Throw met all of those criteria with ease. Lindell Beach is a very family-friendly community, with kids all over the place, and community members that drive slowly and respectfully. Recent BC summers have been HOT, and so having the lake so close is worth its weight in gold. The shore and the many docks and rafts available for use as renters was greatly welcomed, and highly used. The house itself is very clean and very functional. It's stocked very well, and kid-friendly. It's not so pristine or delicate that you are constantly afraid of your kids damaging something. The kitchen and living space are laid out well, and flow easily to the back patio. The house does get hot, so it's essential to close the blinds during the day and open the windows at night to cool. Fire bans are commonplace, so many neighbours use propane fires. We have no complaints, and already have plans to return. Clean and well stocked cottage that makes life easier for families with kids! Clean. Well stocked. Beautiful Area. We had a wonderful time at Stone's Throw cottage. The home is comfortable, clean and perfectly stocked. We celebrated my Fathers Retirement, my birthday and Fathers Day and with all our prepping cooking and playing games we hardly packed much and needed nothing. The home is perfectly stocked with more than what you will need. Very thought out. Cultus lake was a short straight walk down from the house. The views are stunning and with the kayaks,canoe and longboard provided you can enjoy them easily. Chilliwack was a short drive away and we enjoyed Sturgeon fishing, the outdoor waterpark and much more so close by! Monica was quick to respond to any questions we had! Which was very refreshing. Absolutely lovely hosts. Toboggans Cultus Lake, restaurants, golf et mini-golf dans les 10 minutes.